BOSTON — The majority of budgets geared towards brand awareness continue to prioritize linear television over online video, all the more as multi-screen access and OTT distribution help traditional broadcasters reach new audiences, according to a new report from Strategy Analytics, Global Advertising Forecast – 2010-2023 . As evidence for these forecasts, the research noted that major advertisers have shifted ad spend away from digital advertising towards TV, audio and ecommerce, citing digital advertising’s lack of efficiency and concerns over brand security and fraud. In 2018, global TV ad spend will be over $195B and grow to $210B by 2023. The U.S. is the largest television advertising market, accounting for nearly 36% of global TV ad spend in 2018. 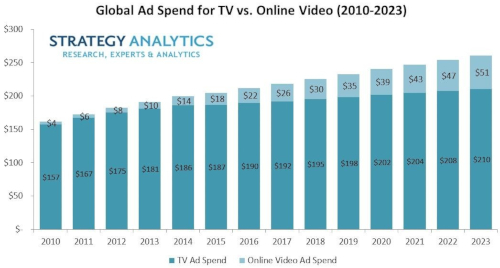 Digital video will represent only 20% of global video ad spend in 2023, despite being the fastest growing digital advertising category (+10.8% CAGR over 2018-2023), reaching nearly $51B in 2023. The U.K., which has been a leader in adoption of digital advertising and was the first country to see total digital advertising eclipse that of TV advertising, leads the pack in terms of digital’s share of total video accounting for 44% in 2023, followed by the U.S. (30%) and China (27%). On a per capita basis, marketers will spend $67.27 per person on digital video advertising in the U.K. versus $65.76 in the U.S. in 2023. Strategy Analytics uses key supply side inputs for historic performance and future market expectations include ad spend by category and macro-economic conditions. TV advertising includes ad spend on linear broadcast and cable channels while digital video ad spend includes online and mobile.